If you’re not heading out of town for the big holiday weekend, there’s still plenty to keep you busy and cultured. 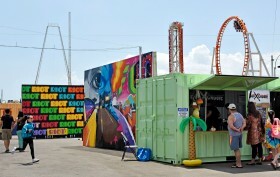 Jeffrey Deitch’s Coney Island Walls continue for a second season, with new murals starting this weekend. Arthelix will stay open for 72 hours for a tireless performative festival, while Williamsburg’s former Cinders Gallery resurrects for a month at Brilliant Champions in Bushwick. Governors Island opens up for the season, with a free Kids festival, joined by a Classical Music festival for adults. If you’re headed to the Hamptons for the weekend, be sure to check out Agathe Snow’s curatorial project with Eric Firestone, or a rousing art talk with Annika Connor at the library. And while you scoot from one place to the next, be sure to check out Leah Oates’ new exhibition for MTA Arts & Design, giving a burst of nature underneath Bryant Park.